Taking your dog camping can be a lot of fun. However, if you are not prepared, it can become a nightmare. When we go camping on weekends, both of my dogs love to go. 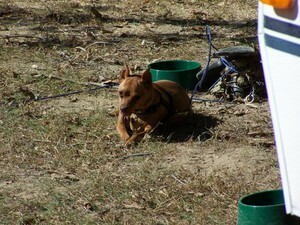 The first time we went camping with dogs, we just had Nakita (a Min Pin). She was around 5 months old. We didn’t know what to expect. We were trying out my in-laws’ new camper at one of the local state parks. From reading the state park brochure, we knew that we couldn’t have Nakita on a leash longer than 6 feet. The same for a lead for tying her up outside. We didn’t have a lead, so we took her exercise pen. Nakita did pretty good the first time she went camping. When taking your dog camping, make sure that your dog can’t get out of your camper or tent! The second time we went camping with dogs, Nakita was just over a year old. This time we took our pop-up camper. Needless to say, Nakita could let herself out of the camper on her own. The camper door handle was knee-high, so she could hit it just right and let herself out. Plus, this time she was a lot more vocal and we had to run a fan to help block out the noise so she would sleep at night. (Okay, maybe so she would let us sleep!) This was the last time we stayed at a state park with our dog Nakita. 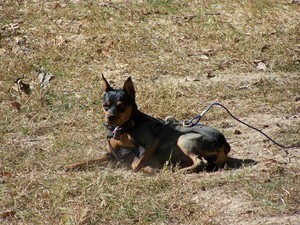 We still go camping with both of our dogs (Nakita and Tosha, both Min Pins). But instead of using a pop-up camper, we’ve built a cabin! Now we like to stay on the river with the girls. Here are the best tips for hiking with your dog: PART1, PART2, and PART3. Each time we go camping with dogs (or to the cabin with them), we always make sure that we take everything the dogs will need. Don’t worry if you overpack the first couple of times. This is bound to happen. When packing, it is better to be safe than sorry. Also pack your dog’s vaccination records and any paper identification you may have for your dog. It’s important to have that with you, in case your dog gets lost. 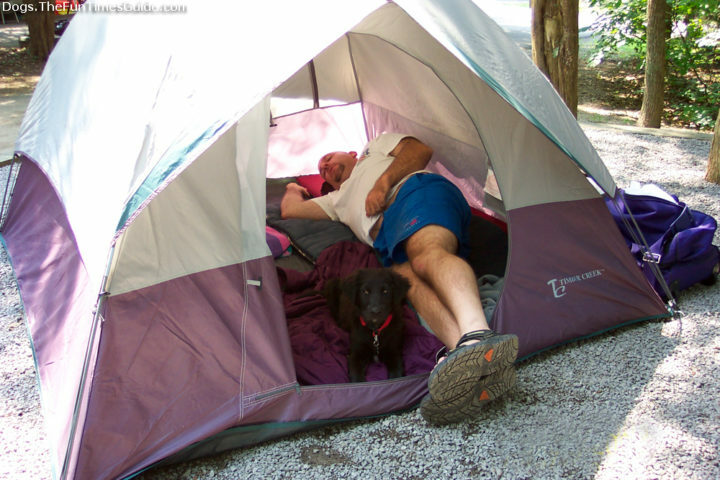 Check out these 8 tips for camping with your dog.